Interested in the Semester in Washington Politics Program? 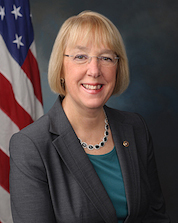 As Washington state’s senior Senator, Patty Murray has a proven track record spanning more than two decades of fighting for Washington statefamilies in the United States Senate. Serving as a member of Senate Democratic leadership since 2007, Patty has established herself as a tireless and effective leader on education, transportation, budget issues, port security, healthcare, women, and veterans issues. In addition to being the first female Senator from Washington state, Patty served as the first female Chair of the Senate Veterans’ Affairs Committee during the 112th Congress and served as the first female Chair of the Senate Budget Committee during the 113th Congress. She is currently Ranking Member of the Senate Health, Education, Labor, and Pensions Committee.